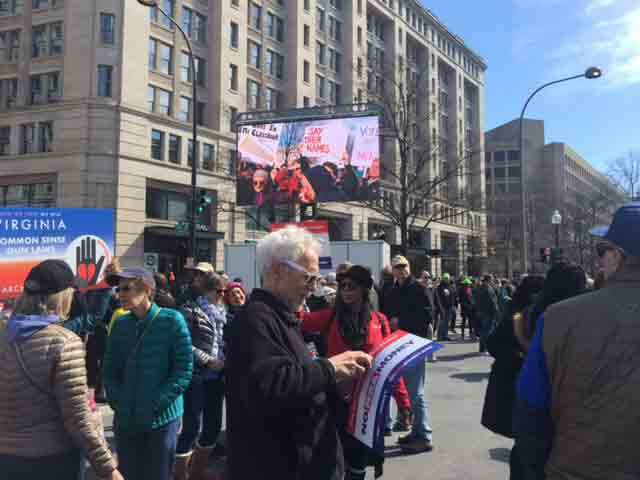 March For Our Lives Rally in Washington D.C.
Pete’s Big TVs was on hand in Washington, DC in support of the massive March For Our Lives protest rally that took place on March 24th. PBTV supplied a variety of screens for the main stage and VIP area in addition to 10 of our LED Mobile Video solutions for the video delay screens down Pennsylvania Avenue so the crowd would be able to see the speakers on the main stage at the Capitol end of the avenue. On March 24, kids and families of March For Our Lives took to the streets of Washington, and across the country, to demand that their lives and safety become a priority and that we end gun violence and mass shootings in our schools today. For client CMI AV, PBTV provided LED screens and crew for the stage and remote locations. All screens were digiLED MK7 7mm LED. Three screens were installed at the stage, one 12’h x 20’w on either side and a 9’h x 16’w VIP screen. PBTV supplied ten mobile video delay screens along Pennsylvania Avenue with screens sizes ranging from 9’h x 16’w up to 13’h x 23’w.